The City of Harrisonburg has partnered with a local organization to revitalize the pond at Purcell Park. 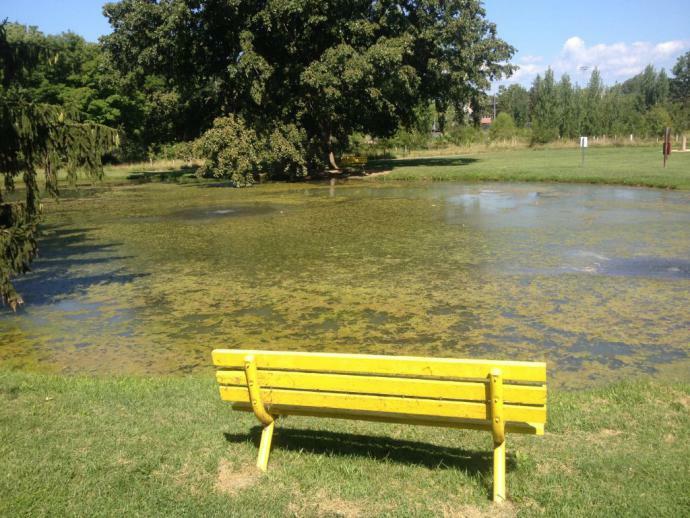 Shenandoah Valley Organics provided funding and ideas for the pond’s revitalization. The project included improvements to the existing aeration system to help decrease algae in the pond, an informational sign explaining the system upgrades, and two new fishing line disposal stations. “This partnership will benefit not only those fishing in the pond but all visitors to the park,” explained Kelley Junco, city’s environmental compliance manager. The enhanced aeration system will create additional turnover, mixing the different water temperatures throughout the pond. This turnover will prevent algal blooms and allow the anaerobic bacteria treatments to eat away at the organic material at the bottom of the pond. Properly disposing of tangled fishing line will help prevent fish and wildlife from getting tangled in the line and will help keep the park litter free for all, including pets. “These improvements will enhance water quality in the pond and downstream in Blacks Run,” explained Trey Jarrels, stream health coordinator. “In turn, this will help provide a better living environment for the aquatic species.” The pond at Purcell Park is a recreational fishing pond that is mostly shallow but is home to largemouth bass, bluegill, grass carp, and channel catfish that has been stocked throughout the years. This pond is a catch and release fishery only and those fishing must have the proper licensing.